The Salesian Artistic Centre is primarily a school of art. It was established in 2005 and is a partnership between the Salesian Community at Bethlehem and the Italian NGO, VIS (Voluntariato Internazionale per lo Sviluppo), with the additional support of the Italian Ministry of Foreign Affairs. 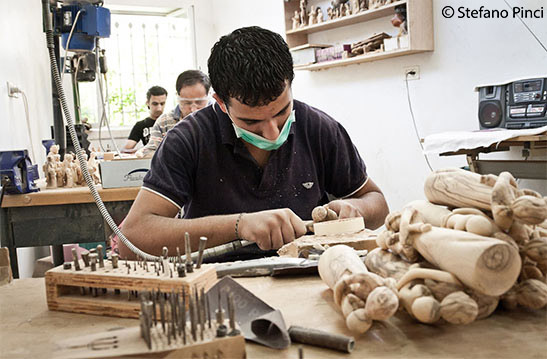 The Centre has the ambitious aim of gathering and conservation of Palestinian handicraft traditions with the creative input from young craftsmen. The Centre is the only school in Palestine formally teaching the traditional handicrafts of olive wood, mother of pearl and ceramics. The Salesians are committed to promoting the Palestinian handicraft tradition, largely unknown and under-appreciated, which is in fact a priceless witness to a century old tradition shared between Palestine and the various parts of the world. During the initial two years, the Centre carried out researches into the history of the Palestinian handicrafts and its declinations in the contemporary world, especially in the cities of Bethlehem and Hebron. Besides promoting the handicraft tradition, the school also continues to teach the traditional techniques in the field of olive wood, mother of pearl and ceramics on a daily basis. At the Centre the students are constantly urged to invent new and creative solutions and innovative designs and ideas which are to be produced with traditional materials and instruments. The creativity of the students is encouraged through lessons in drawing and the history of art, visits to historical and archaeological sites in the territories, workshops and trainings with international artists and, when possible, trips abroad. The results are often surprising. In addition to promoting a combination of tradition and innovation, the Artistic Centre also works towards creating job opportunities for young craftsmen. The Centre carries out various activities aimed at facilitating the insertion of former students into the job market. These include the donation of tools and machinery, assistance in setting up small workshops and microcredit facilities. For a lot of our students this support has allowed them to overcome the traditional obstacles they are faced with when setting up a small business. The Artistic Centre also houses a didactic department with production facilities. In the production section, some of the former students have been employed as trainers: in this way they can keep improving their skills while earning a salary. The Centre’s catalogue displays the handcraft work of our former students who, through our various job opportunities, have managed to start up their own productions. The export of these products is extremely important, as it allows the school meet its minimum costs and expenditures. Showing these small works of art have also given us the opportunity to tell world about the history, traditions and aspirations of the Palestinian people above all to communicate their culture. Our message is one of love for art, longing for justice, the urgency for peace and a desire for freedom. Share our mission and joy by visiting our Center. The Centre functions between 8.00 to 16.00 hrs from Monday to Thursday and on Saturday.